By Brian Liszewski on 08/15/11 • Leave a comment! 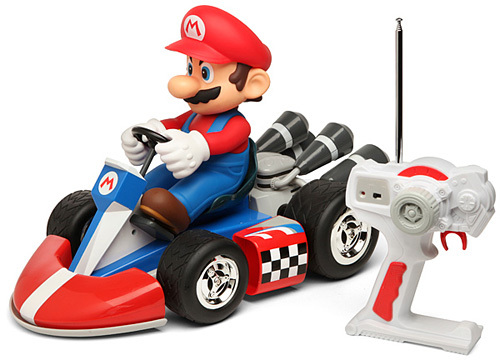 RC toys based on the Mario Kart games have been around for a while now. But typically as very tiny versions, most suitable for racing on a desk. ThinkGeek has managed to get their hands on some much larger versions, but I raise an eyebrow when they refer to them as ‘Super Deluxe’. They’re certainly the most detailed versions of Mario and Yoshi behind the wheel that I’ve ever seen. And you’d expect them to be pretty fast given the size of motor their scale allows for. But I’ve seen misbalanced washing machines make their way across a room faster than these do. Just check out ThinkGeek’s video of them in action. And while it’s kind of cool to see real-life versions of both of these characters in a kart, racing them just isn’t the same without shells, banana peels and other power-ups. Particularly when they’re $119.99 each. By Brian Liszewski on 08/11/11 • Leave a comment! Forget about alarm clocks that try to drive off and escape, shake your bed or even test your shooting accuracy in the morning. We’ve found what is certainly the most effective way to get someone to leap out of bed and kill their alarm. Instead of music or buzzing sounds, the My Wake Up Call alarm clock plays motivational messages from a wide range of overly-energetic type-A personality ‘gurus’ who I’m sure have all appeared on Oprah at one time or another. For $39.99, available sometime soon, you get a miniature pinball machine that houses your iPhone while it’s running their free Pinball Magic app. The flippers, credit/select button and plunger all work in the game since the pinball housing attaches to the iPhone’s dock connector, and the light-up backbox adds as much authenticity as can be added to a pinball machine the size of your phone. It even takes advantage of the iPhone’s tilt sensor, so you’ll want to make sure not to bump the game too hard lest you face the consequences. 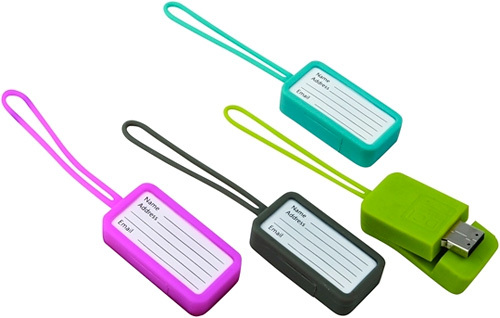 It won’t do much to prevent your luggage from going missing, but if your belongings do get lost while traveling, just think of the many ways this USB flash drive luggage tag could improve your chances of seeing your suitcase again. Obviously you can write your name and contact info on the outside label, but with 2GB of storage at your disposal you can include a pre-recorded video passionately pleading for the return of your lost luggage, detailed maps and directions to wherever you’re staying or maybe even a couple of albums that the finder can keep as a reward if they decide to help you. But just like it’s not recommend to lock your suitcase, the TSA might disapprove of encrypting any of the files on the drive. $29.95 from the Neatoshop, available in the assortment of colors pictured above. As if having to prick your finger on a daily basis to test your blood sugar wasn’t enough, to properly manage your diabetes you also need to double as an accountant or a bookkeeper to monitor your results over time. Thankfully companies like Bayer are aware that it’s not always the easiest thing to stay on top of, so they’ve created the Contour USB Meter which looks like your standard blood sugar tester, except for the addition of a USB connector on one end. 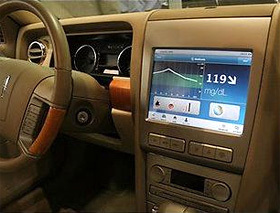 The Contour is able to store 2,000 results, organized and displayed on the color screen by the exact date and time they were recorded, but when it gets full, or at any time actually, you can upload them to Bayer’s Glucofacts Deluxe diabetes management software which provides provides numerous ways to analyze, sort and view the data. While the meter usually sells for about $75 including 25 test strips, it looks like Walgreens has it on sale for just $39.99 right now. There are plenty of universal remotes on the market that cost even more than a decently equipped netbook, but do any of them let you act our your Harry Potter-inspired dreams of being a wizard? Well the Kymera Magic Wand does. It works like a standard universal learning remote but thanks to a built-in accelerometer it’s able to recognize “magical gestures” instead of just pushing buttons. So for example, to turn the volume up or down on your TV you’d simply make clockwise or counter-clockwise gestures with the wand, and to change the channel you’d either flick it up or down. 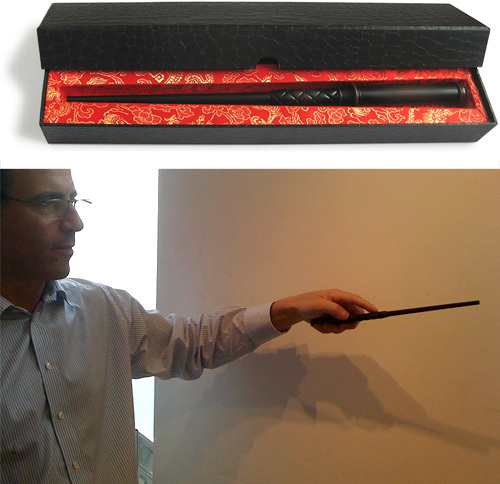 All-in-all there are 13 different gestures recognized by the wand that you can custom-program including big swish, push forward, pull back and even multi-taps. 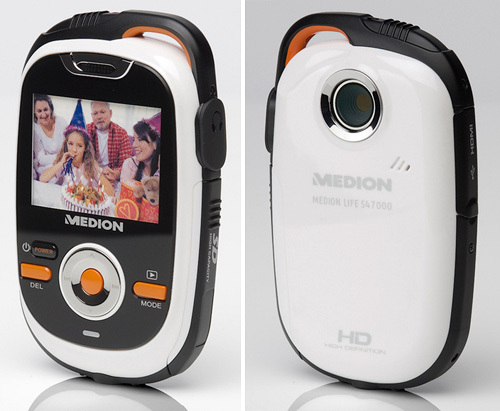 The Medion S47000 is not unlike the Flip UltraHD we reviewed a while ago, except that it seems designed for x-treme sports enthusiasts, complete klutzes, or anyone who’s just not so good at taking care of their toys. On the tech side it captures 720P H.264 MOV files, features a 2-inch LCD display and includes an SD/SDHC card slot which you’ll want to take advantage of immediately since the camera only comes with 90MB of internal memory. It’s also got USB 2.0 for transferring videos to a PC and an HDMI output for connecting it to a hi-def display. And on the ‘rugged’ side the camera features a loop on top for connecting it to… um… something, and is splash resistant. So I guess as long as your choice of sports keeps you well away from water, the S47000 seems like a viable option. It’s available from Medionshop.co.uk for about $164. Much like an excess amount of alcohol in the blood can impair one’s ability to drive (among other things) a deficit in glucose or blood sugar can also have a dangerous effect when you get behind the wheel. In fact, the effects of type 1 diabetes can lead to dizziness, seizures and even a loss of consciousness, which makes operating a vehicle even more dangerous. By Brian Liszewski on 09/12/08 • Leave a comment! If you’ve ever been to the hospital for a broken bone, or have seen a character on House or E.R. suffer the same fate, you’ve probably seen those old-fashioned lightboxes hanging on the walls that doctors use to read x-rays. But a company called BrainLAB is bringing those lightboxes into the 21st century by replacing them with a 30-inch iPhone-esque touch screen that’s linked to a hospital’s digital PACs or Picture Archiving System. The Digital Lightbox can be mounted in an O.R., treatment room or doctor’s office, and it uses an intuitive touch-based interface like Microsoft’s Surface or the iPhone OS. It allows medical personnel to examine various types of images including MRIs, x-rays, PET scans as well as 3D data, and even allows multiple scans or photos to be layered so they can be easily compared. Like the iPhone, images can be navigated or enlarged with the flick of a finger but unlike the iPhone, the Digital Lightbox can also load non-proprietary file types like WMVs or AVIs.